energy contained in wastewater, which has been previously an untapped .... anolyte and injected into the chamber when the read of .... in a microbial fuel cell using slaughterhouse ... fuel cell for wastewater treatment using microfiltration. Feb 24, 2009 - Oleg V. Geydebrekhta, Samantha B. Reeda, Margaret F. Rominea, Frank R. ..... duced into E. coli K12 mutants from the genome-scale Keio. Jun 5, 2014 - (b) The procedure of the colorimetric immunomagnetic assay. 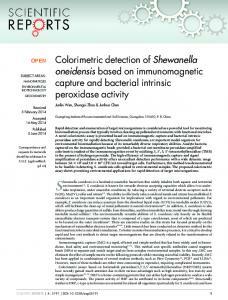 Figure 2 | Optical ..... Biodecolorization of Naphthol Green B dye by Shewanella. Mar 28, 2018 - Thomas J. DiChristina (2018): Iodate Reduction by Shewanella oneidensis ..... potassium-iodide solution were added to each well to initiate. Nov 16, 2010 - Liu M, Alice AF, Naka H, Crosa JH: HlyU protein is a positive ... 29. Banin E, Brady KM, Greenberg EP: Chelator-induced dispersal and killing. 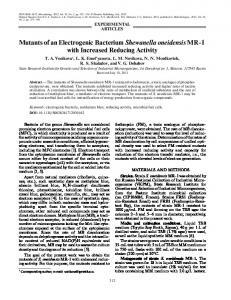 Keywords Metal reduction 4 Shewanella oneidensis 4 Extracellular electron transfer 4 Electron shuttles 4 Nanowires 4 MtrC 4 MtrA 4 MtrB. 2.1 Introduction. Mar 25, 2009 - Zamin Yang1, Anthony V Palumbo1, Adam P Arkin3,6 and Jizhong Zhou*1,4 ...... DP, Nealson KH, Lim H, Yates J 3rd, Brandt CC, et al. Sep 24, 2009 - School of Earth, Atmospheric and Environmental Sciences and Williamson .... defined minimal medium, based on the recipe of Myers and Nealson (27): 1.2 ..... tion from these FT-IR spectra, multivariate statistical tech-. AbstractâThe mutants of Shewanella oneidensis MR 1 resistant to fosfomycin, a toxic analogue of ... order to increase the rate of electron generation is one. Jun 21, 2008 - pher Marx, William Metcalf, Jim Tiedje, Paul Williams, and Klaus ... Doherty, N., M. T. Holden, S. N. Qazi, P. Williams, and K. Winzer. 2006. APPLIED AND ENVIRONMENTAL MICROBIOLOGY, Nov. 2004, p. 6435–6443 0099-2240/04/$08.00⫹0 DOI: 10.1128/AEM.70.11.6435–6443.2004 Copyright © 2004, American Society for Microbiology. All Rights Reserved. toxic levels of pollutants and exposure to ionizing or solar radiation. Recently, the genome sequence of MR-1 has been completed (15). It consists of a 4,969,803-bp chromosome with 4,758 predicted open reading frames (ORFs) and a 161,613-bp plasmid with 173 predicted ORFs. Three prophages, lambdaSo (51,857 bp), MuSo1 (34,551bp), and MuSo2 (35,666 bp), are present on the MR-1 chromosome (15). Compared to E. coli K-12, MR-1 has most of the genes involved in repairing DNA damage and defending oxidative stress. Knowledge on bacterial UV resistance and repairing mechanisms has come predominantly from E. coli. Limited knowledge on molecular and physiological responses to UVR is available for environmentally relevant bacteria. Here, we report the responses of MR-1 following UVC, UVB, UVA, and natural sunlight exposures. We found that MR-1 was uniformly sensitive to all wavelengths of UVR. We also evaluated the contribution of photoreactivation, NER, and mutagenic repair to the survival of MR-1 following UVR exposures. An inefficiently expressed NER system in MR-1 appears to contribute to its high sensitivity to both UVB and UVC. experiments comparing the UVA sensitivity at different physiological stages, cells grown in Davis medium to exponential phase were used directly for UVA treatment, whereas stationary-phase cells were diluted with Davis medium to an optical density at 600 nm of about 0.2 (the density at mid-exponential phase in Davis medium). Photoreactivation assays and MDR assays were conducted as described previously (24, 25). Solar radiation sensitivity assays. Solar radiation sensitivity assays were conducted by exposing cell suspensions to ambient solar radiation. The suspensions were maintained in sterile boxes constructed of 64-mm-thick Acrolyte OP-4 plastic (Professional Plastics, Austin, Tex.). The Acrolyte OP-4 plastic transmits greater than 90% of the total radiation throughout the UVA and UVB wavelengths (Acrolyte OP-4 technical data sheet; Cyro Industries, Arlington, N.J.). Replicate boxes were maintained on ice on a rocking platform during the exposures. Solar UVB radiation was measured with a UVB detector (SED240/UVB1/W) attached to an IL-1700 research radiometer (International Light, Newburyport, Mass.). UVB radiation was measured every second and the readings were integrated over the exposure period, yielding a quantitative output in joules per square meter. At appropriate time points, the boxes were temporarily shaded from sunlight exposure, and two samples (5 ml) were taken. One sample was plated in the dark, and the other was plated following a photoreactivation treatment as described previously (25). Transcriptional analysis of NER by using a cDNA microarray. S. oneidensis MR-1 whole-genome DNA arrays were produced by Liyou Wu and Jizhong Zhou at Oak Ridge National Laboratory (Oak Ridge, Tenn.). Mid-exponentialphase cells (80 ml) grown in Davis medium were split into two parts: one was used for UVR treatments and the other was used as controls. The exposure doses were 3.3 J m⫺2 for UVC, 568 J m⫺2 for UVB, and 25 kJ m⫺2 for UVA, which yielded about a 20% survival rate. After irradiation, cells were transferred to a 100-ml flask and incubated at 30°C on a shaker (200 rpm). An aliquot of cells (12 ml) was transferred to a centrifuge tube after 5, 20, and 60 min of incubation and concentrated by centrifugation at 4°C. The cell pellet was resuspended in 2 ml of supernatant and mixed with 4 ml of bacterial RNA protection reagent (QIAGEN, Valencia, Calif.). The cell suspension was kept at room temperature until all the samples were collected (within 2 h). Cells were then pelleted and stored at ⫺80°C until RNA extraction. Controls were treated in the same way except for the UVR treatment. Total RNA was isolated using a QIAGEN RNeasy mini kit (QIAGEN), digested with RNase-free DNase I (Invitrogen, Carlsbad, Calif.) at 25°C for 30 min, extracted with phenol, phenol-chloroform (1:1), and chloroform, and stored in ethanol at ⫺80°C until use. Both PCR and gel electrophoresis were used to confirm the complete digestion of any contaminating DNA. We confirmed both RNA purity and quality by the 260-to-280-nm absorbance ratio and gel electrophoresis before the reverse transcription reaction. Prehybridization and RNA labeling were performed as described by Schroeder et al. (44) with a 2:3 ratio of 5-(3-aminoallyl)-dUTP and dTTP. Hybridization and washing were carried out as described by Hegde et al. (14). The array was scanned using an Axon 4000B scanner (Axon Instruments, Inc., Union City, Calif.). The data were imported into GeneSpring (Silicon Genetics, Redwood City, Calif.) for analysis. Data were normalized both per chip and per gene (Lowess method). Spots with less than 55% of pixels greater than background plus two standard deviations were not included in the data analysis (34). Functional analysis of uvrA in P. aeruginosa strain UA11079. The uvrA gene (SO4030; GenBank accession no. NP_719560) from S. oneidensis MR-1 was amplified from 50 ng of genomic DNA using primers uvrA NdeI 5⬘ and uvrA BamHI 3⬘ (Table 1) and cloned into pJJK20 (25), creating plasmid pXQ01 (Table 1). A 3.6-kb SphI and BamHI fragment from pXQ01 containing the 0.75-kb umuDC promoter from E. coli and the 2.85-kb uvrA gene from MR-1 was cloned into pJB321, creating pXQ03 (Table 1). pXQ03 was transferred from E.
FIG. 1. Survival of E. coli K-12 (■), S. algae (F), S. putrefaciens 200 (䊐), and S. oneidensis strain MR-4 (Œ), strain DLM-7 (␱), and strain MR-1 (⌬) after UVC irradiation. Plates used for measuring CFU were LB for E. coli K-12, marine agar for S. algae, and TSA for others. Each datum represents the mean (⫾ the standard error of the mean) from three replicates. coli DH10B to P. aeruginosa UA11079 by triparental mating as described by Kim and Sundin (25). The survival after UVC exposure was assayed as described above. a D values are the radiation dose that reduced a cell population to a specified percentage of the original number of the cells (33). D37 is the radiation does required to inactivate 63% of a bacterial population. D10 is the radiation dose which inactivated 90% of the bacterial population. The D values were calculated from the regression line of the exponential slope of the survival curve. FIG. 2. Survival of S. oneidensis MR-1 after UVA irradiation. Both exponential- and stationary-phase MR-1 cells grown in Davis medium were irradiated with various UVA doses and plated on both LB and TSA plates to measure CFU. Œ, exponential phase, LB plates; ⌬, exponential phase, TSA plates; ■, stationary phase, LB plates; 䊐, stationary phase, TSA plates. Each datum represents the mean (⫾ the standard error of the mean) from at least three replicates. stationary cells at lower UVA doses. At high UVA dose, exponential cells were slightly more resistant to UVA. The difference in survival rate on LB plates was more than 10-fold at the dose of 30 kJ m⫺2 (Fig. 2). Contribution of photoreactivation to survival of S. oneidensis strain MR-1 after UVR exposure. Annotated photolyase (512 amino acids) in S. oneidensis MR-1 shares 44% identity to that of E. coli K-12 (472 amino acids). The amino terminus contains the conserved domain for binding light harvesting cofactor, and the carboxyl terminus contains the conserved FAD binding domain of DNA photolyase. The tryptophans at enzyme active sites (W306 in E. coli K-12) and the one involved in substrate Pyr-Pyr-specific binding (W277 in E. coli K-12) are conserved in the photolyase of MR-1 (W342 and W312 in MR-1, respectively), which may indicate a similar catalyzing mechanism with that of E. coli K-12 (26). Photoreactivation conferred a significantly increased survival rate to S. oneidensis MR-1 in both UVB- and UVC-irradiated cells: as much as 177- and 365-fold after irradiation at UVC doses of 12 and 15 J m⫺2 (Fig. 3A) and 11- to 23-fold after irradiation at UVB doses of 774 to 1,032 J m⫺2 (Fig. 3B). For solar light-irradiated cells, further incubation under visible light for 1 h increased the survival rate 3- and 10-fold at solar UVB doses of 640 and 800 J m⫺2 (Fig. 3C) compared to those plated in the dark immediately after treatments. MDR activity in S. oneidensis MR-1. The umuDC operon in S. oneidensis MR-1 is located on the mega plasmid. The byproduct of MDR, an increase in cellular mutation frequency, can be assayed by examining the increase in the occurrence of spontaneous mutants following irradiation. We examined the occurrence of Rifr mutants in both UVC- and UVB-treated samples (Fig. 4). The overall frequency was slightly higher in UVC-treated samples (Fig. 4A) than in UVB-treated samples (Fig. 4B) over the UV dose range used in this study. A mutation frequency as high as 6.6 ⫻ 10⫺6 was observed at 16.5 J of UVC m⫺2 (Fig. 4A). This result indicates that MDR-mediated translesion synthesis is functional in S. oneidensis MR-1. Expression of NER component genes after UVR exposure. Expression of NER component genes (uvrA, uvrB, and uvrD) after UVC, UVB, and UVA irradiation were examined using a microarray that contained about 95% of MR-1 ORFs. In contrast to the NER system of E. coli, we did not observe any induction with any of the three UVR treatments at any of the incubation times. The ratio of irradiated sample to control (unirradiated sample) was in the range of 0.9 to 1.2 (Fig. 5). To confirm that the uvr genes were truly transcribed, we designed gene-specific primers that targeted both amino-terminal and carboxyl-terminal fragments of uvrA, uvrB, and uvrD (Table 1). Positive amplicons were detected in all UVR-treated cells as well as in the controls (unirradiated samples) by using reverse transcription-PCR (data not shown). This result indicated that, unlike in E. coli K-12, the uvrA, uvrB, and uvrD genes of MR-1 were not damage inducible. In agreement with the above observation, we were unable to identify any E. coli-like SOS box near the translation region (⫺200 to ⫹40) (8, 27) for any of the three genes examined, whereas putative LexA binding sites were found for recA, lexA, umuDC, and dinP, a homolog of umuC, with a relatively low heterology index (HI) value (Table 3). FIG. 3. Survial of S. oneidensis MR-1 following photoreactivation (F) or in the dark (␱) after UVC (A), UVB (B), or solar light (C) irradiation. LB plates were used for measuring CFU. Each datum represents the mean (⫾ the standard error of the mean) from three replicates. FIG. 4. Analysis of MDR in S. oneidensis MR-1 following UVC (A) and UVB (B) exposure. The number of spontaneous mutations conferring Rifr in the absence of UVR treatment has been subtracted. LB plates were used for measuring CFU. Each datum represents the mean (⫾ the standard error of the mean) from three replicates. FIG. 5. Relative gene expression of NER component genes uvrA, uvrB, and uvrD at 5 min (filled with dots), 20 min (filled with diagonal stripes), and 60 min (filled with lines) after UVC (A), UVB (B), and UVA (C) irradiation. Ratios for UVR-irradiated samples and unirradiated samples were taken at the same time points. Each datum is the mean (⫾ the standard error of the mean) of 8 to 12 data points from three biological replicates and two technical replicates. HI indicates the affinity of LexA to the SOS box (27). A low HI indicates a strong binding of the LexA to the SOS box. Distance to a putative translation start condon. Boldface indicates the conserved sites of the E. coli SOS box. FIG. 6. Survival of P. aeruginosa UA11079 (Œ), P. aeruginosa UA11079 complemented with uvrA of MR-1(⽧), and P. aeruginosa PAO1 (F) after UVC irradiation. LB plates were used for measuring CFU. Each datum represents the mean (⫾ the standard error of the mean) from three replicates. in repairing cellular damage caused by UVR and ionizing radiation in organisms other than D. radiodurans. MR-1 is an excellent model to compare and understand the cellular function and regulation in response to various radiation stresses. This knowledge will contribute greatly to our fundamental understanding of the traits important in determining bacterial radiation resistance. ACKNOWLEDGMENTS This work was supported by grant DE-FG-02-02ER63342 to Michigan State University from the Office of Biological and Environmental Research of the U.S. Department of Energy. We also thank Jizhong Zhou for stimulating our work on strain MR-1, Liyou Wu for providing DNA microarrays, Alison Murray and Veronica Gru ¨ntzig for providing related bacterial strains, and members of the Shewanella Federation for helpful discussions on the biology and genomics of these organisms. REFERENCES 1. Arrage, A. A., T. J. Phelps, R. E. Benoit, and D. C. White. 1993. Survival of subsurface microorganisms exposed to UV radiation and hydrogen peroxide. Appl. Environ. Microbiol. 59:3545–3550. 2. Arrieta, J. M., M. G. Weinbauer, and G. J. Herndl. 2000. Interspecific variability in sensitivity to UV radiation and subsequent recovery in selected isolates of marine bacteria. Appl. Environ. Microbiol. 66:1468–1473. 3. Blatny, J. M., T. Brautaset, H. C. Winther-Larsen, K. Haugan, and S. Valla. 1997. Construction and use of a versatile set of broad-host-range cloning and expression vectors based on the RK2 replicon. Appl. Environ. Microbiol. 63:370–379. 4. Courcelle, J., A. Khodursky, B. Peter, P. O. Brown, and P. C. Hanawalt. 2001. Comparative gene expression profiles following UV exposure in wildtype and SOS-deficient Escherichia coli. Genetics 158:41–64. 5. Eisenstark, A. 1987. Mutagenic and lethal effects of near-ultraviolet radiation (290–400 nm) on bacteria and phage. Environ. Mol. Mutagen. 10:317– 337. 6. Eisenstark, A. 1989. Bacterial genes involved in response to near-ultraviolet radiation. Adv. Genet. 26:99–147. 7. Favre, A., E. Hajnsdorf, K. Thiam, and A. Caldeira de Araujo. 1985. Mutagenesis and growth delay induced in Escherichia coli by near-ultraviolet radiation. Biochimie 67:335–342. 8. Ferna ´ndez de Henestrosa, A. R., T. Ogi, S. Aoyagi, D. Chafin, J. J. Hayes, H. Ohmori, and R. Woodgate. 2000. Identification of additional genes belonging to the LexA regulon in Escherichia coli. Mol. Microbiol. 35:1560–1572. 9. Figurski, D. H., and D. R. Helinski. 1979. Replication of an origin containing derivative of plasmid RK2 dependent on a plasmid function provided in trans. Proc. Natl. Acad. Sci. USA 79:1648–1652. 10. Fogliano, M., and P. F. Schendel. 1981. Evidence for the inducibility of the uvrB operon. Nature (London) 289:196–198. 11. Friedberg, E. C., G. C. Walker, and W. Siede. 1995. DNA repair and mutagenesis. ASM Press, Washington, D.C. 12. Gascon, J., A. Qubina, A. Perex-Lezaun, and J. Urmeneta. 1995. Sensitivity of selected bacterial species to UV radiation. Curr. Microbiol. 30:77–182. 13. Grant, S. G., J. Jessee, F. R. Bloom, and D. Hanahan. 1990. Differential plasmid rescue from transgenic mouse DNAs into Escherichia coli methylation-restriction mutants. Proc. Natl. Acad. Sci. USA 87:4645–4649. 14. Hegde, P., R. Qi, K. Abernathy, C. Gay, S. Dharap, R. Gaspard, J. Earlehughes, E. Snesrud, N. Lee, and J. Quackenbush. 2000. A concise guide to cDNA microarray analysis. BioTechniques 29:548–562. 15. Heidelberg, J. F., I. T. Paulsen, K. E. Nelson, R. J. Gaidos, W. C. Nelson, T. D. Read, J. A. Eisen, R. Seshadri, N. Ward, B. Methe, R. A. Clayton, T. Meyer, A. Tsapin, J. Scott, M. Beanan, L. Brinkac, S. Daugherty, R. T. DeBoy, R. J. Dodson, A. S. Durkin, D. H. Haft, J. F. Kolonay, R. Madupu, J. D. Peterson, L. A. Umayam, O. White, A. M. Wolf, J. Vamathevan, J. Weidman, M. Impraim, K. Lee, K. Berry, C. Lee, J. Mueller, H. Khouri, J. Gill, T. R. Utterback, L. A. McDonald, T. V. Feldblyum, H. O. Smith, J. C. Venter, K. H. Nealson, and C. M. Fraser. 2002. Genome sequence of the dissimilatory metal ion-reducing bacterium Shewanella oneidensis. Nat. Biotechnol. 20:1118–1123. 16. Jacobs, J. L., and G. W. Sundin. 2001. Effect of solar UV-B radiation on a phyllosphere bacterial community. Appl. Environ. Microbiol. 67:5488–5496. 17. Jagger, J. 1983. Physiological effects of near-ultraviolet radiation on bacteria. Photochem. Photobiol. Rev. 7:1–75. 18. Jagger, J. 1985. Solar UV actions on living cells. Praeger, New York, N.Y. 19. Jeffrey, W. H., P. Aas, M. M. Lyons, R. B. Coffin, R. J. Pledger, and D. L. Mitchell. 1996. Ambient solar radiation-induced photodamage in marine bacterioplankton. Photochem. Photobiol. 64:419–427. 20. Joux, F., W. H. Jeffrey, P. Lebaron, and D. L. Mitchell. 1999. Marine bacterial isolates display diverse responses to UV-B radiation. Appl. Environ. Microbiol. 65:3820–3827. 21. Kenyon, C. J., and G. C. Walker. 1980. DNA-damaging agents stimulate gene expression at specific loci in Escherichia coli. Proc. Natl. Acad. Sci. USA 77:2819–2823. 22. Kenyon, C. J., and G. C. Walker. 1981. Expression of E. coli uvrA gene is inducible. Nature (London) 289:808–810. 23. Kidambi, S. P., M. G. Booth, T. A. Kokjohn, and R. V. Miller. 1996. recAdependence of the response of Pseudomonas aeruginosa to UVA and UVB irradiation. Microbiology 142:1033–1040. 24. Kim, J.-J., and G. W. Sundin. 2000. Regulation of the rulAB mutagenic DNA repair operon of Pseudomonas syringae by UVB (290 to 320 nanometers) radiation and analysis of rulAB-mediated mutability in vitro and in planta. J. Bacteriol. 182:6137–6144. 25. Kim, J.-J., and G. W. Sundin. 2001. Construction and analysis of photolyase mutants of Pseudomonas aeruginosa and Pseudomonas syringae: contribution of photoreactivation, nucleotide excision repair, and mutagenic DNA repair to cell survival and mutability following exposure to UVB radiation. Appl. Environ. Microbiol. 67:1405–1411. 26. Kim, S.-T., and A. Sancar. 1993. Photochemistry, photophysics, and mechanism of pyrimidine dimmer repair by DNA photolyase. Photochem. Photobiol. 57:895–904. 27. Lewis, L. K., G. R. Harlow, L. A. Gregg-Jolly, and D. W. Mount. 1994. Identification of high affinity binding sites for LexA which define new DNA damage-inducible genes in Escherichia coli. J. Mol. Biol. 241:507–523. 28. Lin, J.-R., and A. Sancar. 1992. (A)BC excinuclease: the Escherichia coli nucleotide excision repair enzyme. Mol. Microbiol. 6:2219–2224. 29. Little, J. W., and D. W. Mount. 1982. The SOS regulatory system of Escherichia coli. Cell 29:11–22. 30. Liu, C., Y. A. Gorby, J. M. Zachara, J. K. Fredrickson, and C. F. Brown. 2002. Reduction kinetics of Fe(III), Co(III), U(VI), Cr(VI), and Tc(VII) in cultures of dissimilatory metal-reducing bacteria. Biotechnol. Bioeng. 80: 637–649. 31. Middleton, S. S., R. B. Latmani, M. R. Mackey, M. H. Ellisman, B. M. Tebo, and C. S. Criddle. 2003. Cometabolism of Cr(VI) by Shewanella oneidensis MR-1 produces cell-associated reduced chromium and inhibits growth. Biotechnol. Bioeng. 83:627–637. 32. Miller, C. D., W. S. Mortensen, G. U. L. Braga, and A. J. Anderson. 2001. The rpoS gene in Pseudomonas syringae is important in surviving exposure to the near-UV in sunlight. Curr. Microbiol. 43:374–377. 33. Moseley, B. E. B. 1983. Photobiology and radiobiology of Micrococcus (Deinococcus) radiodurans. Photochem. Photobiol. Rev. 7:223–274. 34. Murray, A. E., D. Lies, G. Li, K. Nealson, J. Zhou, and J. M. Tiedje. 2001. 37. 38. 39. 40. 41. 42. 43. 44. 45. 46. 47. DNA/DNA hybridization to microarrays reveals gene-specific differences between closely related microbial genomes. Proc. Natl. Acad. Sci. USA 98:9853–9858. Myers, C. R., and K. H. Nealson. 1988. Bacterial manganese reduction and growth with manganese oxide as the sole electron acceptor. Science 240: 1319–1321. Nohmi, T., A. Hakura, Y. Nakai, M. Watanabe, S. Y. Murayama, and T. Sofuni. 1991. Salmonella typhimurium has two homologous but different umuDC operons: cloning of a new umuDC-like operon (samAB) present in a 60-megadalton cryptic plasmid of S. typhimurium. J. Bacteriol. 173:1051– 1063. Pfeifer, G. P. 1997. Formation and processing of UV photoproducts: effects of DNA sequence and chromatin environment. Photochem. Photobiol. 65: 270–283. Rivera, E., L. Vila, and J. Barbe. 1996. The uvrB gene of Pseudomonas aeruginosa is not DNA damage inducible. J. Bacteriol. 178:5550–5554. Rivera, E., L. Vila, and J. Barbe. 1997. Expression of the Pseudomonas aeruginosa uvrA gene is constitutive. Mutat. Res. 377:149–155. Sambrook, J., and D. W. Russell. 2001. Molecular cloning: a laboratory manual, 3rd ed. Cold Spring Harbor Laboratory Press, Cold Spring Harbor, N.Y. Sancar, A., and M. Tang. 1993. Nucleotide excision repair. Photochem. Photobiol. 57:905–921. Sancar, A. 1994. Mechanisms of DNA excision repair. Science 266:1954– 1956. Sancar, A. 1996. DNA excision repair. Annu. Rev. Biochem. 65:43–81. Schroeder, R. G., L. M. Peterson, and R. D. Fleischmann. 2002. Improved quantitation and reproducibility in Mycobacterium tuberculosis DNA microarrays. J. Mol. Microbiol. Biotechnol. 4:123–126. Siegel, E. C. 1983. The Escherichia coli uvrD is inducible by DNA damage. Mol. Gen. Genet. 191:397–400. Smith, B. T., and G. C. Walker. 1998. Mutagenesis and more: umuDC and the Escherichia coli SOS response. Genetics 148:1599–1610. Sundin, G. W., and J. L. Jacobs. 1999. Ultraviolet radiation (UVR) sensitivity analysis and UVR survival strategies of a bacterial community from the phyllosphere of field-grown peanut (Arachis hypogeae L.). Microb. Ecol. 38:27–38. Sundin, G. W., S. P. Kidambi, M. S. Ullrich, and C. L. Bender. 1996. Resistance to ultraviolet light in Pseudomonas syringae: sequence and functional analysis of the plasmid-encoded rulAB genes. Gene 177:77–81. Sundin, G. W., and J. Murillo. 1999. Functional analysis of the Pseudomonas syringae rulAB determinant in tolerance to ultraviolet B (290–320 nm) radiation and distribution of rulAB among P. syringae pathovars. Environ. Microbiol. 1:75–87. Sutton, M. D., B. T. Smith, V. G. Godoy, and G. C. Walker. 2000. The SOS response: recent insight into umuDC-dependent mutagenesis and DNA damage tolerance. Annu. Rev. Genet. 34:479–497. Tang, M., X. Shen, E. G. Frank, M. O’Donnell, R. Woodgate, and M. F. Goodman. 1999. UmuD2C is an error-prone DNA polymerase, Escherichia coli pol V. Proc. Natl. Acad. Sci. USA 96:8919–8924. Venkateswaran, K., D. P. Moser, M. E. Dollhopf, D. P. Lies, D. A. Saffarini, B. J. MacGregor, D. V. Ringelberg, D. C. White, M. Nishijima, H. Sano, J. Burghardt, E. Stackebrandt, and K. H. Nealson. 1999. Polyphasic taxonomy of the genus Shewanella and description of Shewanella oneidensis sp. nov. Int. J. Syst. Bacteriol. 49:705–724. Webb, R. B. 1977. Lethal and mutagenic effects of near-ultraviolet radiation. Photochem. Photobiol. Rev. 2:169–261. Woodgate, R. 1992. Construction of umuDC operon substitution mutation in Escherichia coli. Mutat. Res. 281:221–225. Woodgate, R., and S. G. Sedgwick. 1992. Mutagenesis induced by bacterial UmuDC proteins and their plasmid homologues. Mol. Microbiol. 6:2213– 2218. Yasui, A., and A. P. M. Eker. 1998. DNA photolyases, p. 9–32. In J. A. Nickoloff and M. F. Hoekstra (ed. ), DNA damage and repair, vol. 2. DNA repair in higher eukaryotes. 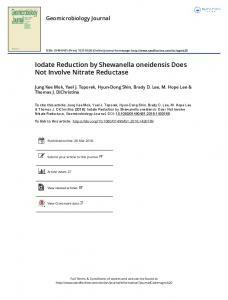 Humana Press, Inc., Totowa, N.J.
Report "Survival of Shewanella oneidensis MR-1 after UV Radiation Exposure"